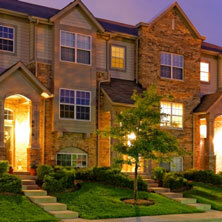 Natural stones are widely used in commercial and residential landscaping in Calgary and with good reason. Not only do these add a very dramatic look to your landscape, but complement the styling of casual as well as formal styled outdoor spaces., In fact, natural stones such a granite, flagstone, bluestone, travertine etc. lend a certain solidity and stability to the landscape as well. Walls– If you are getting a boundary wall, garden walls or retaining wall installed in your landscaping in Calgary, you should consider using natural stone for it. 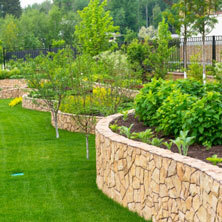 Retaining walls made of natural stone lend support to the landscape and look stunning as well. It is possible to build dual-function walls with inbuilt seating or planters. Steps– Natural stone steps are a great addition to any yard. These can be built leading down from an elevated patio or deck or even and multilevel or terraced gardens. 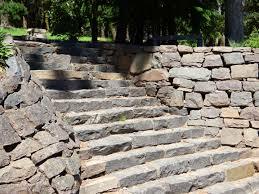 Stone steps are charming and add a very rustic feel to the landscape. Rockeries– A rockery or boulder art adds a very distinctive look to any outdoor space. 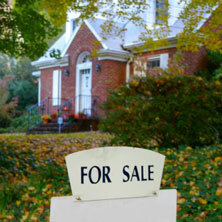 In fact, it is possible to turn it into the focal point of your yard and design the rest of the areas around it. Skilled landscapers can design beautiful rockeries that also have different types of plantings installed in them. Waterfalls– Many people like to add water features in their landscaping in Calgary. A rock waterfall or a bubbling brook lined with natural stones of different shapes and sizes can create an amazing and exotic look in your garden. Fire Pits and Fireplaces– A fire feature adds warmth and comfort to the outdoor spaces of your property. Using natural stone in the construction of a fireplace or fire pit can lend a very put-together appearance to your landscape. The area around these features can also be covered with natural stone pavers to complete the look. Aside from these, natural stone can be used for poolscaping as well as in the construction of columns and more. For any information about how natural stone can be used in your landscaping in Calgary project, feel free to contact us at 403-407-5777 or drop us a line via this Online Form and an expert from Project Landscape will revert shortly.